L as strung = 485 mm, W cord = 3 mm, typical bead L = 37.4 mm, W = 33.5 mm, Ht = 30.5 mm, diam hole = 8 mm [RTS 21/6/2004]. Collected by Edward Evan Evans-Pritchard either in the early part of 1930 (probably February to April), or between February and June of 1931 [CM; RTS 9/7/2004]. Thick yellowish buff cord made of three twisted strands of plant fibre (Pantone 7401C); this may be European in origin. 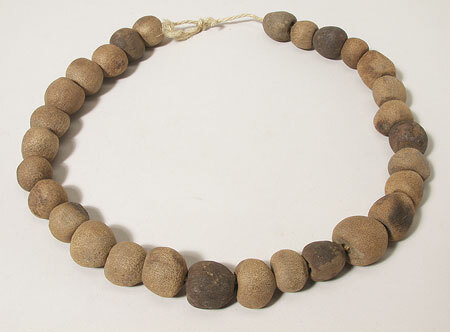 A series of 29 large and irregularly spherical dom or palm nut beads have been strung onto this cord, with the two ends then being knotted together to secure them, making a simple loop that could be hung around the necks of cattle. These beads retain the natural shape of the nut, which is slightly concave on the upper end, but have been pierced through the centre with a large circular hole, the edges of which appear to be blackened, suggesting that they were burnt through using a heated tool. The surface is largely a mottled yellowish brown colour (Pantone 7508C); a few beads have burnt patches on their surfaces, and a handful are a darker brown colour all over, perhaps as a result of burning. Complete, although the cord is fraying in areas, and some of the nut surfaces have begun to flake away, particularly those that appear to have been burnt. The necklet weighs 587.9 grams, and has a length of 485 mm as strung. The cord is 3 mm wide; the nuts vary in dimensions, but a typical one measures 37.4 mm long, 33.5 mm wide and 30.5 mm high, with a thread hole diameter of 8 mm. This object was collected by Edward Evan Evans-Pritchard during his first or second seasons of fieldwork amongst the Nuer, e.g. : in February to April 1930 or between February and June of 1931, in 'the dry season'. In the former, he spent around three and a half months in Leek territory at Yahnyang and Pakur on the Bahr el Ghazal, in Lou territory at Muot Dit, and at Adok, amongst the Dok Nuer. In the latter, he spent five and a half months at Nasir, on the Nyanding River, and at Yakwat on the Sobat River (see E.E. Evans-Pritchard, 1940, The Nuer , and the map of Evans-Pritchard's fieldwork in D.H. Johnson, "Evans-Pritchard, the Nuer, and the Sudan Political Service", African Affairs 81 no. 323, p. 233) (pers. comm. Chris Morton 2004). This collar would have been hung around the necks of cattle. Accession Book Entry [IX, p. 16] 1931 [insert, in pencil] 66 [end insert] E. EVANS-PRITCHARD , Esq. Dec. Specimens collected by himself in the EASTERN SUDAN, viz. [...] [pencil insert, p. 18] 25 [end insert] - Collar of large palm-nuts strung on a cord, for hanging round the necks of cattle, NUER. Additional Accession Book Entry [p. 17] - 1931.66.25 No given AP [red biro] A20 F10 32. Sparks, Rachael. "Nuer animal collar" Southern Sudan Project (in development). 03 Jan. 2006. Pitt Rivers Museum. <http://southernsudan.prm.ox.ac.uk/details/1931.66.25/>.